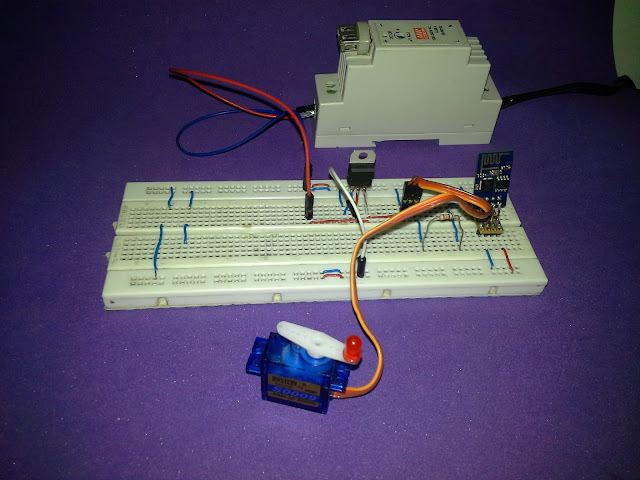 This time the integration of ESP8266 and the Node-RED platform has been made integrating an actuator in this case a servo controlled by PWM with rotation from 0 to 180 degrees. 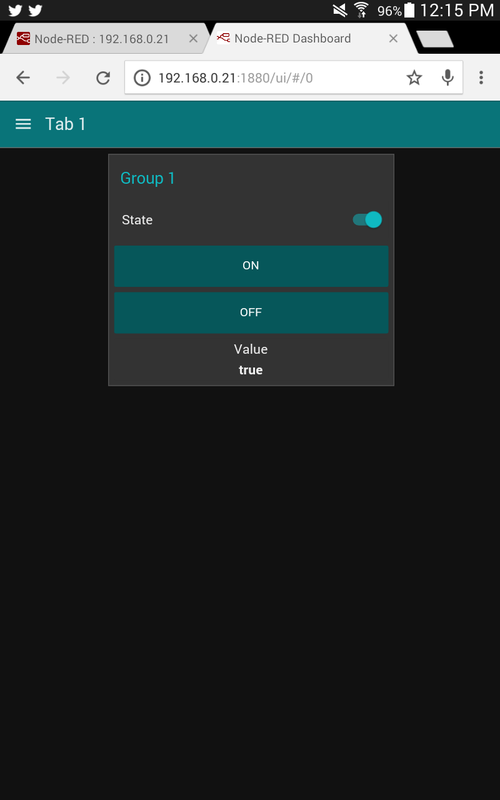 From an HMI or SCADA Web creator on Node-Red-Dashboard using as base the MQTT Protocol and pubsubclient library converting the ESP8266 into MQTT Client. Note: To successfully complete this tutorial you must perform the following tutorials. The ESP8266 module has been configured as an MQTT client, as subscriber of the "servo" topic, the ESP8266 will receive a value from 0 to 100% and will convert it from 0 to 180 degrees for servo control via PWM by GPIO 02. Previously it has been installed in a computer with lubuntu (Ubuntu) Linux, the server Broker MQTT which performs the management of messages in the network, Mosquitto has been used in this case. 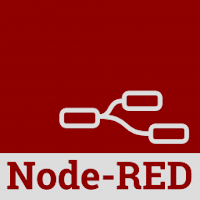 A sequence of nodes has been created to send data from the Dashboard. To integrate the module ESP8266 with node-red IoT platform has been used MQTT protocol, there are client libraries for esp8266 as MQTT in this case I decided to use the library pubsubclient. 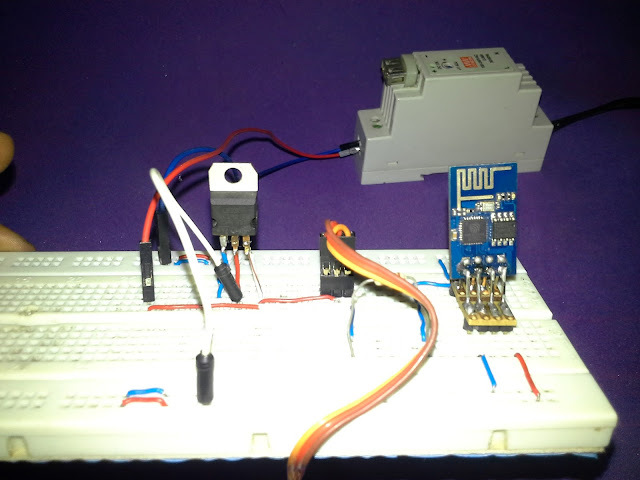 This example will receive Node Red that receives data from the ESP8266 and allow control a LED connected to GPIO 02 from a dashboard created in Node Red Dashboard . 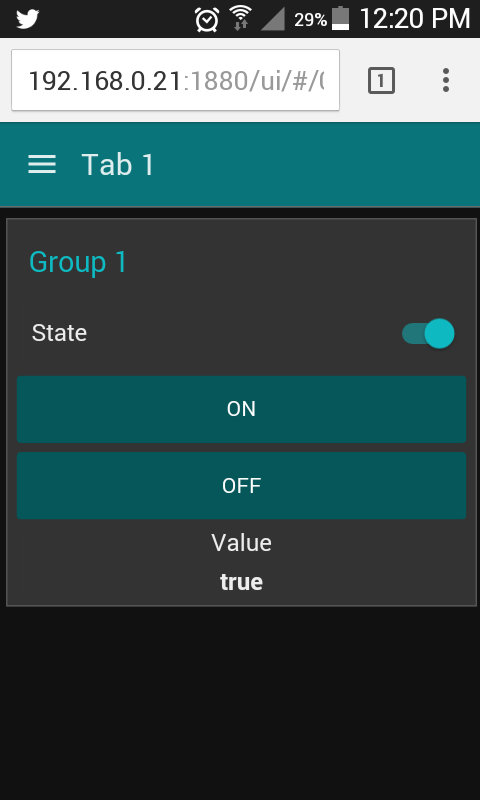 Arduino IDE add the pubsubclient library using the search engine libraries or manually by downloading the library and storing it in their respective folder for libraries. 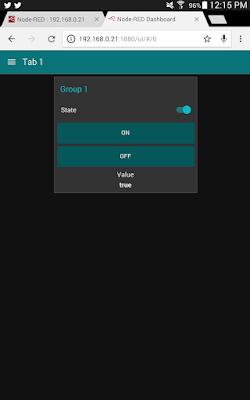 Arduino IDE code performs several steps but definire major, Broker connection with MQTT, function post (send messages) even specific topic and subscribe function (receive messages) even specific topic. 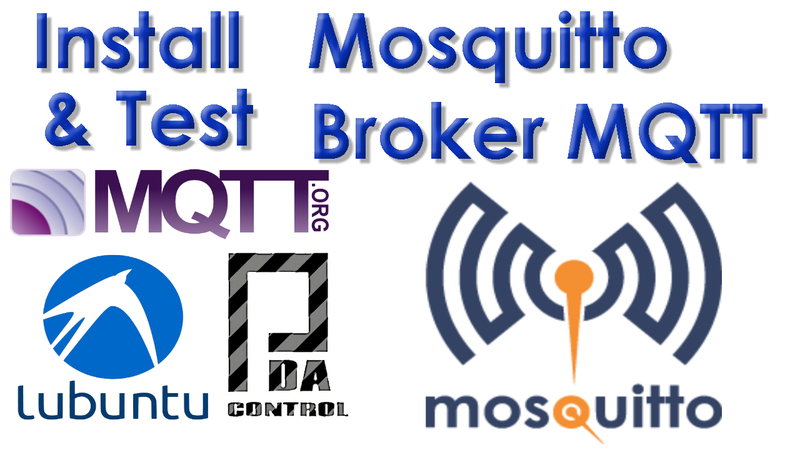 Set parameters network PASSWORD and SSID is required to have previously installed a MQTT Broker server which performs the function server broker, in this case I use Mosquitto MQTT. This function enter 3 personal parameters of the library pubsubclient.h topic, payload (load) and size, performs printing of the topic and the message, to turn on the LED diode sweeps payload in a specific position to determine the state 1 or 0. 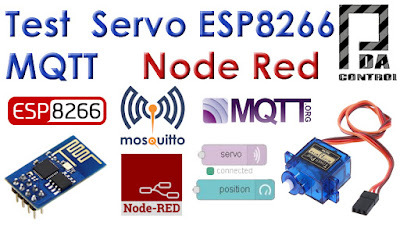 1 Node client receiving messages MQTT (subscribe) from ESP8266 through the topic "event" node debugging and debug. 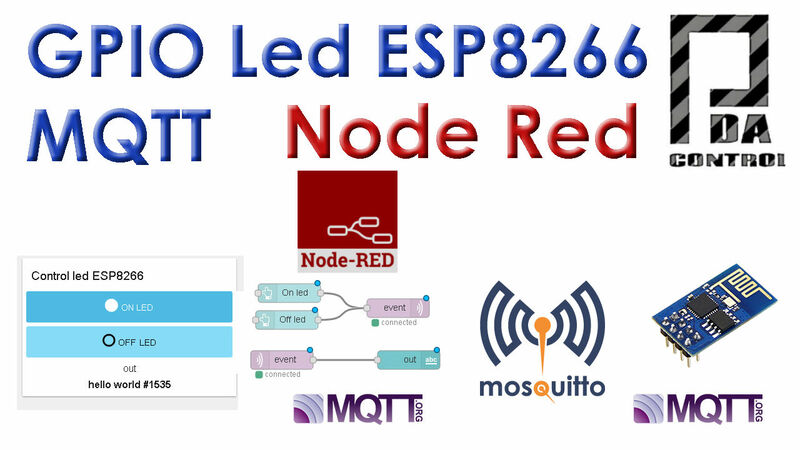 2 Building 2 button "On" "Off" for sending node values MQTT (publish) to ESP8266 topic "event"
3 Node text text output to display status LED diode. In short MQTT is a TCP / IP protocol lightweight messaging, the model is publication - subscriber requires a message broker which is responsible for directing recipients through a topic in common. It is considered to Andrew James Stanford-Clark as the author of this protocol. 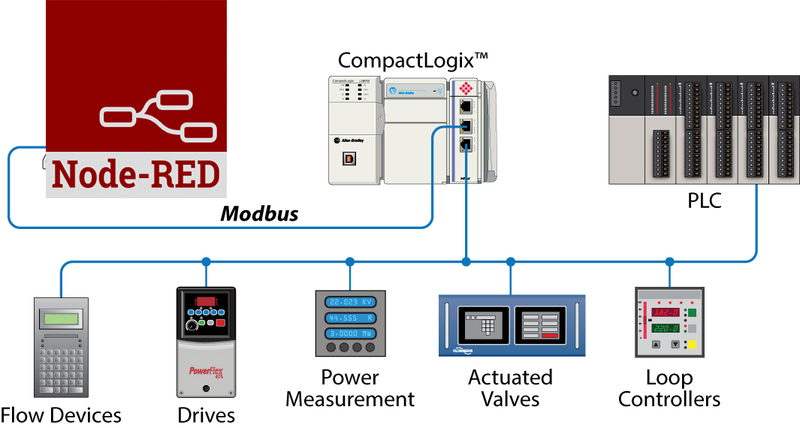 I believe that this protocol is very practical and is currently implemented in IoT and M2M "machine-to-machine" applications, field application in this case would be sending monitoring and control data between servers, sensors and actuators. 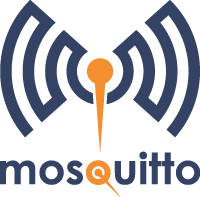 Eclipse mosquitto ™ It is open source, it is a message broker this intermediary MQTT allows the connection of devices. 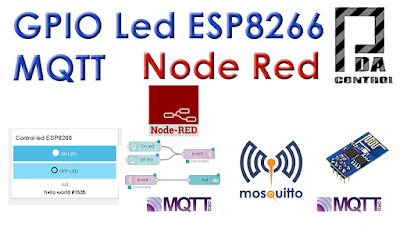 MQTT to connect devices with Node-red I use mosquitto as Broker, this is an extra complement Node red in the next tutorial installation. Enter the terminal lubuntu command as root. 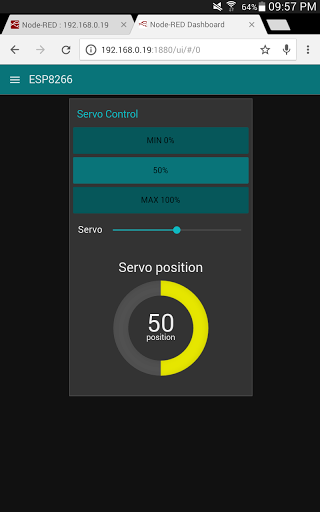 Our client is suscruibira the theme or topic "Sensor_MQTT" meaning that all published messages associated with this topic will be received. 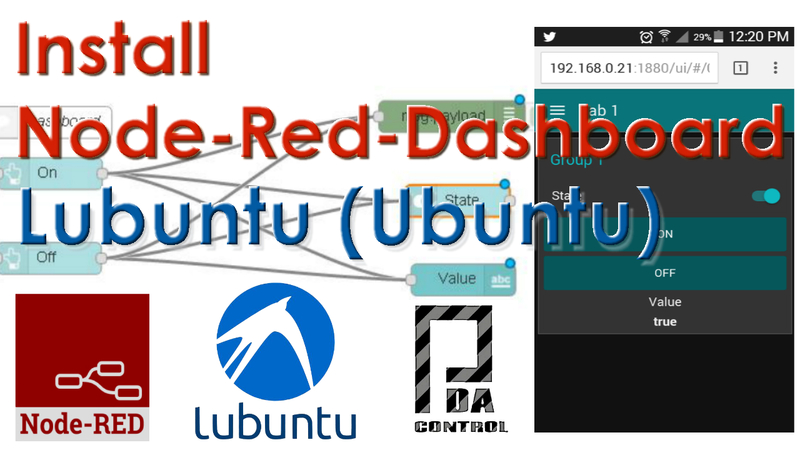 Our client publish the message "Error Sensor" through the topic "Alert_MQTT"
Node red has dashboard to create and view dashboards to interact with the devices in the internet of things. 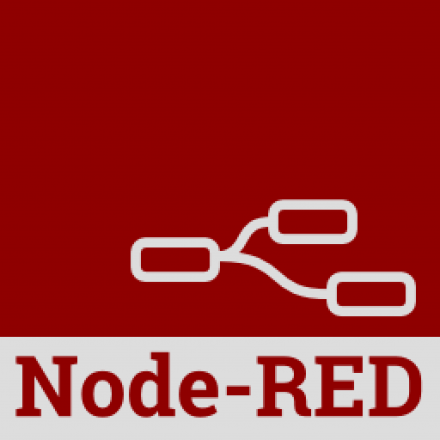 There was an earlier version call node-red-contrib-ui which was replaced by node-red-dashboard created by Dave Conway-Jones (dceejay) thanks for your great contribution. 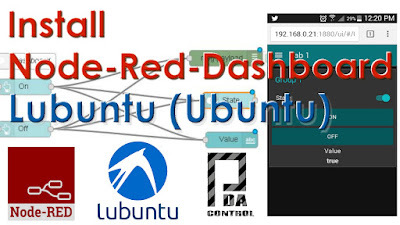 In this case we will install this add to our Node-red, previously installed Lubuntu (Ubuntu) in next tutorials integrate devices already used previously as Arduino and ESP8266. 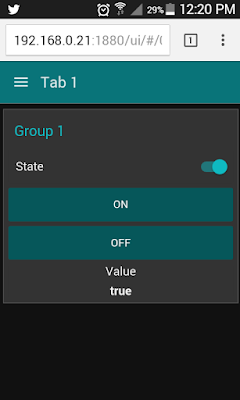 The dashboard tab to organize our dashboard by tabs and groups since it does not have a tool own design, but consider this way very practical to design without worrying about compatibility design screens different resolutions on devices like smartphones tablets and pc. 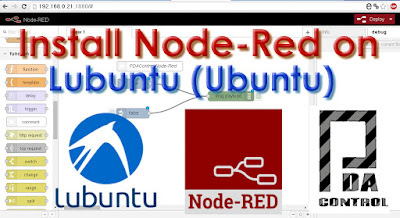 In the search for attachable communication protocols Node-Red I found thanks to the collaborative development a library or nodes for communication Modbus TCP IP, the following tutorial is indicated as installing the nodes in lubuntu (Ubuntu). 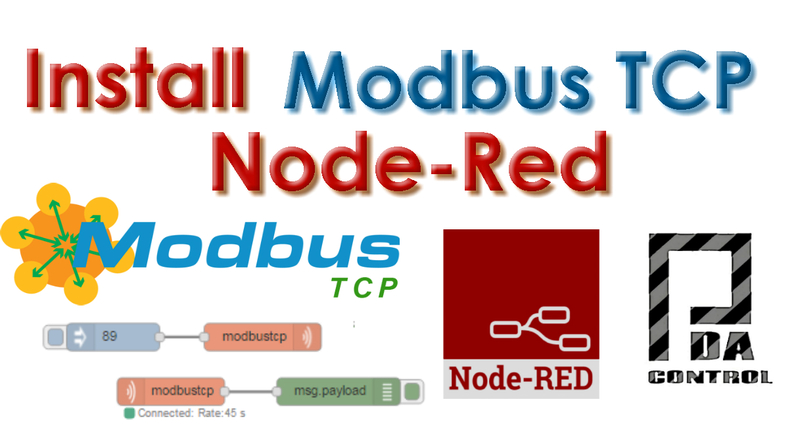 This library node-red-contrib-modbustcp was created by Jason D. Harper was based on the jsmodbus library, this library allows our Node-Red server is configured as master Modbus TCP, it contains 2 nodes one reading and one writing . 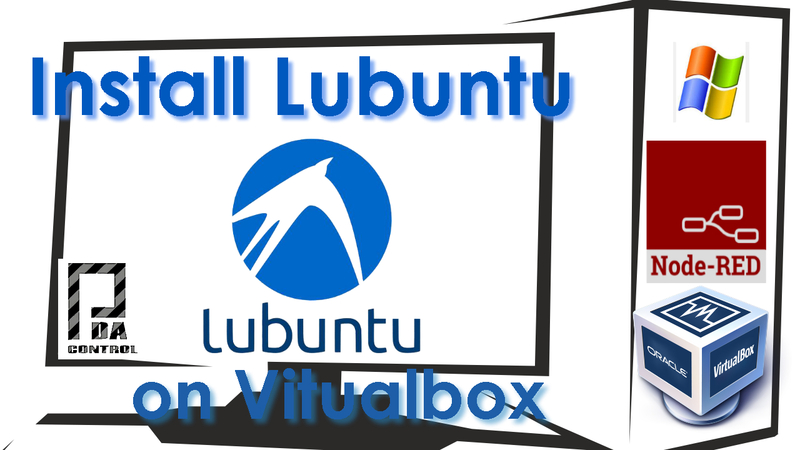 I decided to create my desktop a virtual machine in VirtualBox with Lubuntu (Linux) combination LXDE and Ubuntu, the purpose of this virtual machine is testing the Platform IoT Node-Red Interconnect devices like Arduino and ESP8266 among others . 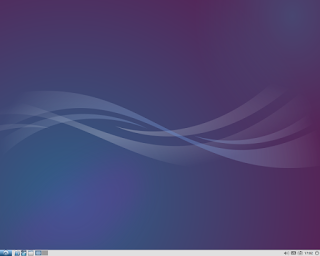 VirtualBox is installed on Windows, download the latest version of lubuntu in this case lubuntu-14.04.5-desktop-i386.iso for later installation. Clarifying that current and commonly Node-Red is installed on the platform Raspberry pi, a very practical and excellent use for this great device, but I decided to virtualize Lubuntu Linux for practicality, lightness and stability of hardware, there are also other current platforms excellent virtualization as docker among others, I hope this tutorial is taken as an introduction to those who do not conecen linux and a reminder to those already familiar with this powerful operating system and .. have fun. -Restoration fast image copies virtualbox in case of errors.